1. 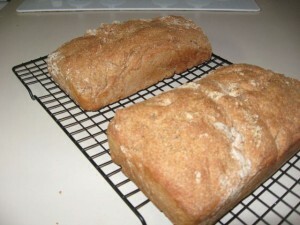 It calls for whole wheat flour so it’s hearty and healthy. 2. It requires no kneading and takes only a minute to mix. Note: I only had 6 cups of whole wheat flour so I halved the recipe. 1. Thoroughly grease 3 (in my case, 2) loaf pans. Sift the flour and salt together in a large bowl. 2. Sprinkle the dried yeast over 2/3 cup of the water. After a couple minutes stir in sugar and let sit for 10 minutes. 3. Make a well in center of flour and stir in yeast mixture and remaining water. The dough should be slippery. Mix for about 1 minute. 4. Divide among prepared pans, cover with oiled plastic wrap and let rise, in a warm place, for 30 minutes or until the dough has risen by about a third to within 1/2 inch of the top of the pans. 5. Meanwhile, preheat oven to 400 degrees F. Bake for 40 minutes or until the loaves are crisp and sound hollow when tapped on the bottom. Turn onto a wire rack to cool. All of the dry ingredients. Just out of the oven. Hurry up and cool down. I’m hungry! Crispy, colorful and delicious! This fresh springtime salad will have your taste buds asking for more. Bring a large pot of salted water to a boil over high heat. Blanch asparagus until just tender, drain, and immediately plunge into ice water to stop the cooking process. When the asparagus is cold, drain and slice on the diagonal into 1-inch pieces. In a small bowl, stir together tahini, water, lemon juice, and garlic. Stir in sugar to taste. Toss together asparagus, red cabbage, radishes, green onions, feta, pine nuts, and dill in a large bowl. Pour in tahini dressing and mix to combine. Cinco de Mayo is just two days away. So let’s celebrate with one of my favorite dishes, Chicken Enchiladas. In one hour you can create a traditional, healthy, and fun meal for your friends and family. Saute onion and garlic in pan until tender. Add corn and chiles. Stir well to combine. Add canned tomatoes, saute 1 minute. Garnish with cilantro, scallion, sour cream (or yogurt) and chopped tomatoes before serving. 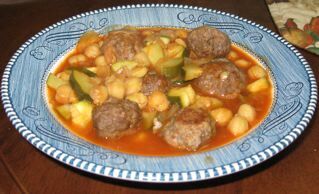 Serve with Spanish rice and beans. Place peanut butter, garlic, ginger root, honey, vinegar, sesame oil, soy sauce and cayenne pepper in a food processor or blender. Process until finely ground. Place chicken thighs in baking pan and pour peanut pesto over. Bake in 375 degrees F oven about 35 minutes. Remove to serving platter and sprinkle with peanuts and green onions. Makes 4 servings. Recipe from The Chicken Book: the 43rd national chicken cooking contest. 1. Heat olive oil in a large soup pot over medium heat, and add the onion and carrot. Cook, stirring, until the onion is tender, about 5 minutes. Add half the garlic and 1/2 tsp salt. Stir together for a minute, just until the garlic is fragrant, and add the tomatoes and their liquid. Turn up the heat slightly and cook, stirring often, until tomatoes have cooked down and smell fragrant, about 10 minutes. 2. Stir in lentils, water, bay leaf, sprigs of thyme and parsley, and bring to boil. Reduce heat to low, cover and simmer 30 minutes. Add the remaining garlic, salt to taste and add the greens. Continue to simmer, covered, for another 15 minutes. Add freshly ground pepper, taste and adjust seasoning. 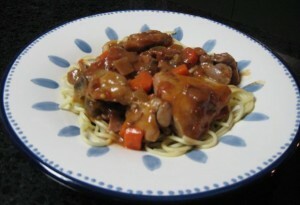 Stir in pasta, and continue to simmer until the pasta is tender, 5 to 10 minutes. Serve. Yields 6 to 8. Heather recently bought me The Complete Asian Cookbook by Charmaine Solomon. Last week I tried this recipe and it turned out great! Cook chicken pieces in 2 tbsp peanut oil. Once lightly browned, add coconut milk and curry paste. Cook for approx 15 minutes. Add fish sauce. Simmer for 30 minutes. Add basil simmer for 5 more minutes. Serve over rice. 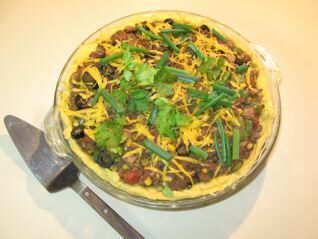 If you’re in a hurry, you can serve this spicy Tex-Mex chili in a prepared pie crust, without the crust, or in taco shells. For an extra flourish, top it with sliced avocado and a generous spoonful of sour cream. 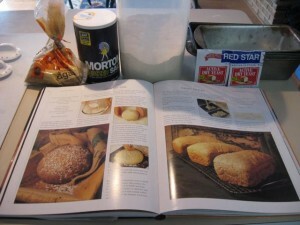 For the crust: In a medium-size bowl, combine the pie crust mix, cornmeal, sugar, and red pepper. Cut in the butter until mixture resembles coarse meal. Add the water and stir just until mixture comes together. Preheat the oven to 350°F. Roll out the dough to make a pastry shell. Press the dough into the pie pan and flute the edges. Poke the pastry with a fork in several places to prevent it from bubbling up when cooking. 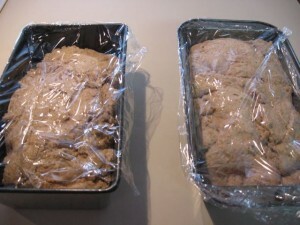 Bake, uncovered, until lightly crisped around the edges – about 20 minutes. Remove from the oven and set aside. For the filling: Heat the oil in a skillet over moderate heat for 1 minute. Saute the scallions and garlic for a minute or so.. Stir in cocoa, chili powder, cinnamon, coriander, cumin, and salt, and saute 1 minute longer. Add the beef and saute until browned – about 5 minutes. Add the green pepper and saute, stirring occasionally, until soft – about 5 minutes. Stir in tomatoes, beans and corn and black olives. Preheat oven to 350°F. Using a sharp knife, slice squash in half. Remove seeds and discard or try roasting them later. Dot squash with butter (optional). Sprinkle with salt and pepper. Place in shallow roasting pan, seed sides down, with about 1/8 inch water in bottom of pan. Roast for approx. 30-40 minutes or until you can easily insert a fork right into the rind of the squash. NOTE: About halfway through cooking the squash tuck unpeeled garlic cloves around squash in roasting pan. Alternative method – if there is still a lot of water in the bottom of the squash pan place garlic gloves in their own vessel or use a toaster oven – about 10 minutes at 400°F. Garlic is done roasting if you prod the clove and find it soft. Removed squash from oven and, using a spoon, scoop out flesh from shells and place in food processor or blender. (If cooked nice and soft, you can also blend in a bowl with a spoon.) Discard (compost) squash shells. Slip garlic cloves out of their skins and add to squash. Process until smooth, adding all but 1 tablespoon of the Parmesan cheese and then the cream (milk). Sprinkle with salt and pepper and reserved cheese. Best if served warm with pita chips, Melba toasts or cheese straw. Serves four. Let’s spice things up in the kitchen this Fall with a great vegetarian dish. Voila! And dinner is served. *2 cups dry makes 6 cups cooked. 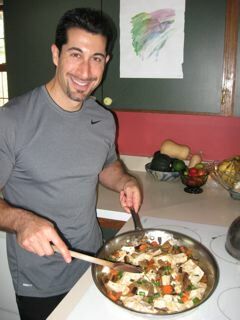 **Omit oil if using non-stick cookware.